How will the market for single family homes in the Charlotte, NC metro change over the next 5 years? 20 years? How does the metro GDP in the Charlotte metro compare to others? What are the patterns in metro rental income and homeownership/vacancy rates? How are they trending? 2013 vintage metropolitan areas include approximately 94 percent of the U.S. population — 85 percent in metropolitan statistical areas (MSAs) and 9 percent in micropolitan statistical areas (MISAs). Of 3,143 counties in the United States, 1,167 are in the 381 MSAs in the U.S. and 641 counties are in the 536 MISAs (1,335 counties are in non-metro areas). This section is focused on the Charlotte, NC-SC metro. It is not intended to be a study of the metro but rather illustrate how relevant DMI resources can be brought together to examine patterns and change and develop insights. The data, tools and methods can be applied to any metro. The Charlotte-Concord-Gastonia, NC-SC MSA is shown in the graphic below. The green boundary shows the 2013 vintage metro, black boundary/hatch pattern shows the 2010 vintage boundary, state blue boundary, counties labeled. Viewing graphic with gesture/zoom enabled device suggested. Click here to view a profile for the Charlotte metro. The profile shows the addition of five counties relative to the Census 2010 vintage. Use this interactive table to view demographic attributes of these counties and rank/compare with other counties. The Census 2010 population of the 2013 vintage metro is 2,217,012 (25th largest) compared to 1,758,038 (33rd largest) based on the 2010 vintage of the metro. The Charlotte metro ranks 24th in population (2,296,569) among 2013 vintage metros based on the 2012 estimate. Several metros have 2012 population of similar size including: San Juan-Carolina-Caguas, PR, Portland-Vancouver-Hillsboro, OR-WA, San Antonio-New Braunfels, TX, Orlando-Kissimmee-Sanford, FL, Sacramento–Roseville–Arden-Arcade, CA with others quite close. See interactive table to examine other metros in a similar manner. View selected ACS 2012 demographic-economic characteristics for the Charlotte metro (2013 vintage) in this interactive table. View this metro in context of peer metros; e.g., similarly sized metros. The Charlotte metro 2012 total population of 697,439, median household income of $50,108, percent high school graduates 88.1%, percent college graduates 31.3% and 15.2% in poverty. 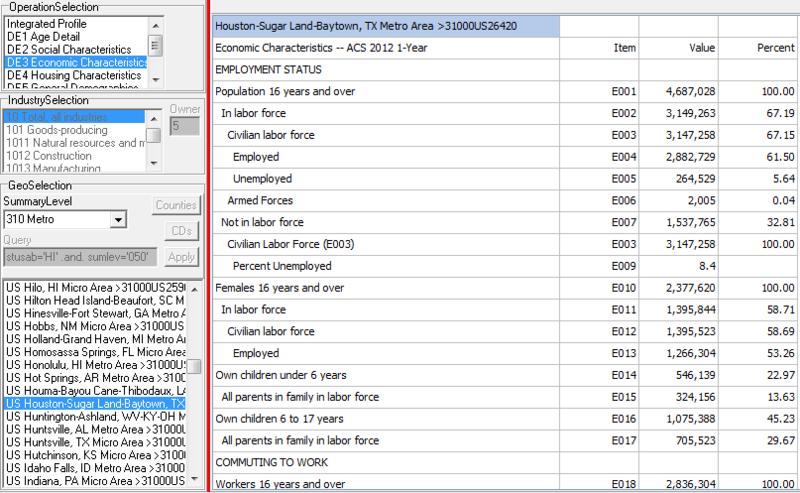 Use the APIGateway to access detailed ACS 2012 demographic-economic profiles. A partial view of the Charlotte metro DE-3 economic characteristics profile is shown below. Install the no fee CV XE tools on your PC to view extended profiles for Charlotte or any metro. See U.S. ACS 2012 demographic-economic profiles. Viewing graphic with gesture/zoom enabled device suggested. View selected Charlotte metro Gross Domestic Product (GDP) patterns in this interactive table. The Charlotte metro 2012 real per capita GDP is estimated to be $118,862. The metro ranks 21st among all 381 metros. 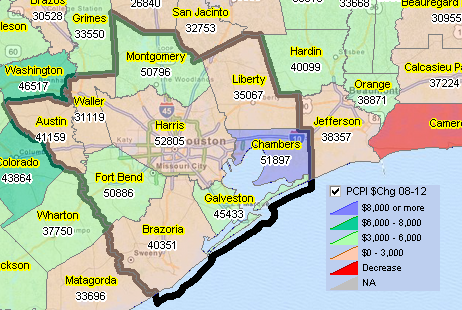 By definition, metropolitan areas are comprised of one or more contiguous counties. Metropolitan areas are not single cities and typically include many cities. Metropolitan areas are comprised of urban and rural areas and often have large expanses of rural territory. A business and demographic-economic synergy exists within each metro; metros often interact with adjacent metros. The demographic-economic makeup of metros vary widely and change often.